Nine cities in seven European countries are teaming up to encourage the re-use of open data for better city services Four of the nine cities – Aarhus (DK), Aberdeen (UK), Amsterdam (NL), and Gent (BE) – are OASC member cities. A vast amount of data created and stored by cities remains unused. The reasons for insufficient re-use of data vary widely – from lack of knowledge to security concerns. However, if city data is unlocked in a secure way and made interoperable between departments and organisations, cities will be able to tap into a huge resource, which will improve city services. This is the goal of the recently launched SCORE (Smart Cities and Open data REuse) project, supported by the Interreg North Sea Region programme. Co-ordinated by the City of Amsterdam, the project team works on defined and shared challenges, such as sustainable mobility, water, and environment, and co-develops solutions. These solutions will then be tested and replicated in existing urban living labs. says Tamas Erkelens, Program Manager Data Innovation at City of Amsterdam and SCORE project coordinator. 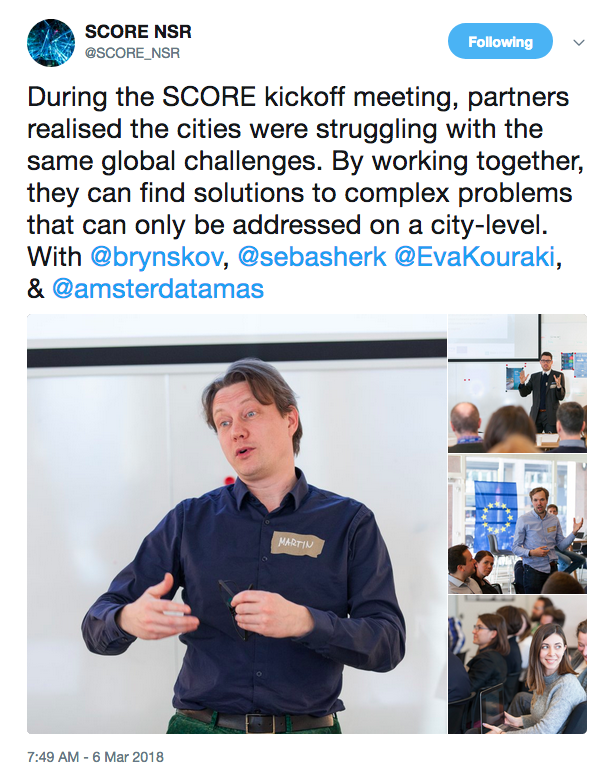 The cities participating in the SCORE project are: Aarhus (DK), Aberdeen (UK), Amsterdam (NL), Bergen (NO), Bradford (UK), Dordrecht (NL), Gent (BL), Gothenburg (SWE), and Hamburg (GER). Other project partners are: University of Amsterdam (NL), Johanneberg Science Park (SE), University of Aarhus (DK), University of Bradford (UK), and Digipolis (BE). The SCORE project is funded by the Interreg North Sea Region programme, a European Regional Development Fund, and is running from 1 September 2017 to 28 February 2022 with a total budget of € 5.8 Million. Follow SCORE on Twitter for the latest updates.